Maria Gaglione, 24, from Pittsburg, died after the car she was a passenger in during a high-speed chase with police in a stolen car. Her parents assert she did not know the car had been stolen 2 days earlier and was not participating in the flight from law. Jurors at a coroner’s inquest ruled the death was not an accident and was caused by the police in a negligent and dangerous chase. The father of the victim spoke out in agreement with the decision. Two Clayton sheriff’s deputies chased the car at speeds of over 80 MH in an area designated at 25 MPH in Concord. The driver of the stolen car was Amy Fiasconaro, 32, of Antioch. She lost control of the car and hit a wall at 109 MPH. She also hit a tree on Myrtle Drive in front of Myrtle Farm Montessori School. The roof of the car smashed Gaglione in the passenger seat. She was pronounced dead at the scene. Fiasconaro was found a few feet away crawling around on her hands and knees. She first said Gaglione was driving. Fiasconaro was found to have heroin and methamphetamine in her bloodstream. Coroner’s inquests are held in all officer-involved or in-custody deaths in Contra Costa County. They are publicly held to determine the cause of death. Findings cannot be appealed. They have no criminal or civil implications. Gaglione’s death was said to have been caused by someone’s negligence and not an accident. Her father feels the police were at fault and should be fired and imprisoned. Is a Comma Really Worth $10 Million? Today, I would like to speak to you about how details are important when it comes to the practice of law. Sometimes, all it takes is one tiny little thing that can change the outcome of an entire claim. For those who don’t know, an Oxford comma is what we also refer to as the serial comma. It is a stylistic recommendation that a comma should be used before coordinate conjunctions (usually and or or) in a series of three or more terms. This advocation exists to try and avoid ambiguity. But the world of writing seems to keep fighting a constant battle on whether this comma should be taken as a mere recommendation or something more. Patients rely on doctors and other medical professionals to maintain a standard of care when providing medical services. While instances of medical malpractice are not uncommon, some acts are so negligent that patients have no alternative but to file suit against the responsible parties. This is the case of a California woman, Carol Critchfield, who suffered four years from the negligence of medical staff during a routine surgery before she received the medical attention she needed. In 2007, Critchfield was admitted to Simi Valley Hospital for a hysterectomy. She was a relatively healthy 56-year old woman undergoing a routine procedure. However, rather than recovering from her operation as expected, Critchfield began to experience problems shortly after being released from the hospital. Three days after coming home, she began waking up each morning dehydrated and nauseous. When she began to experience severe pain, her apprehensive husband took her to the emergency room. The emergency room personnel did not take Critchfield’s complaints very seriously. They took x-rays and concluded that it was nothing more than constipation. Critchfield was sent home. One year later, Critchfield again had to be taken to the emergency room but this time she was experiencing blurry vision, fainting and heavy perspiration. The emergency room staff’s diagnosis was gastrointestinal issues and they advised her not to eat spicy foods. By 2011, Critchfield experienced bleeding in addition to the other symptoms she continued to experience. Suspecting an ovarian cyst, her gynecologist recommended that she have her ovaries removed. It was at this time that the surgeon discovered a sponge that had been left inside her during the previous surgery. Scar tissue had developed around the sponge. In order to remove the sponge, the surgeon had to remove a large section of her intestine. Female Sacramento Attorney Viciously Attacked By Dog, Part 7 of 7. Copies of her bills are referenced herein. Please note, Ms. Rich’s wage loss and medical damages are increasing weekly. As discussed above, defendant, Paul Stevens, had already signed a document acknowledging the subject dog Franz was a vicious dog that had to be restrained. Despite this and with a conscious disregard for the safety of others, Paul Stevens permitted the dog to run free and attack Ms. Stevens. We have sued Mr. Stevens for punitive damages. As you know, punitive damages, if awarded, must be paid personally by Mr. Stevens. It will not be paid by his insurance. A failure by Allstate Insurance Company to settle this case will expose Mr. Stevens to financial ruin. 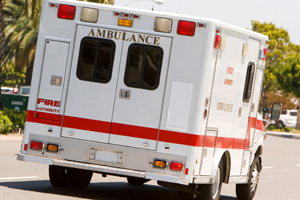 Sacramento-area Farmer Catastrophically Injured In Tour Bus Accident, Part 6 of 6. “Q. Now, in the other 16 years you drove, do you recall making any driver error?